The Diversified Trading Institute’s primary mission is to teach the art of trading. Through the DTI Method and DTI's RoadMap™ Software, we'll teach you how to navigate the markets by taking a global viewpoint. During our four-level RoadMap™ Trader Educational Program, you will receive a comprehensive education in futures, stocks and options. With the reinforcement and repetition our students experience through live trading alongside our professional traders in the DTI Educational TradeRoom, you will build the confidence to use DTI's RoadMap™ Software to trade at your highest level. ​Included with each level of your RoadMap™ education is a one year license to DTI's RoadMap™ Software. Tom Busby has spent the last 20 years continuously developing this proprietary software to include every feature he feels is important to trade the markets. 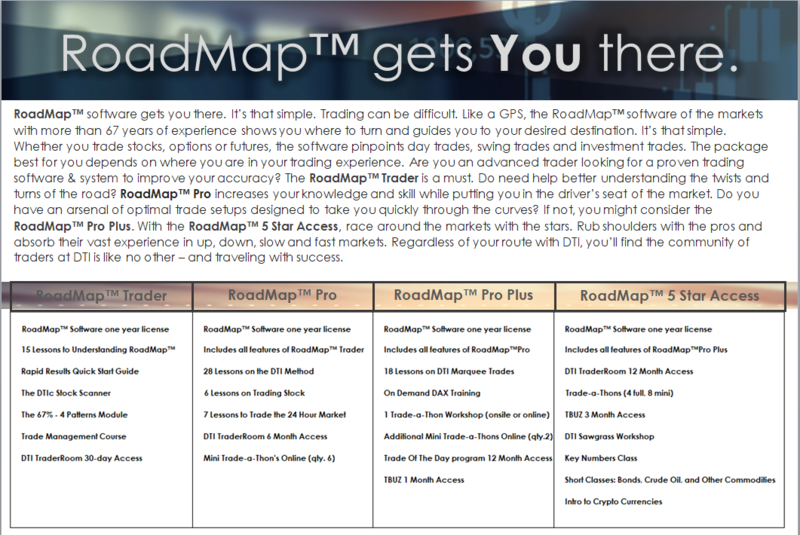 Simply put, the RoadMap™ Software is the heartbeat of the DTI Method. The second step to becoming a RoadMap™ trader requires an understanding of the methodology Tom Busby has developed over his 40 years of trading. It takes a proven system to enjoy a lifetime of trading and Tom has already spent countless years testing the DTI Method. * For your educational benefit, you must complete at least the RoadMap™ Trader course before beginning our upper level courses. You will also receive access to 6 online mini trade-a-thon's where you can enjoy six morning's throughout the year trading alongside Tom Busby and Geof Smith, our chief instructor. Taking you even further into your DTI RoadMap™ education is RoadMap™ Pro Plus. Here you will receive access to a number of DTI's premier services, including access to trades that Tom and Geof personally take on a daily basis. * All material included in RoadMap™ Pro is included in RoadMap™ Pro Plus. With RoadMap™ 5-Star Access, you will gain access to nearly everything DTI has to offer! This includes all new material created through DTI during your time as a 5-Star Access member. You will also have access to numerous on-demand courses DTI instructors have taught in years past. As an added bonus, you will be invited to join Tom and other DTI staff at the annual DTI Sawgrass Workshop! This workshop is held at a resort destination, where you will receive three days of education all while relaxing on the beaches of Florida.